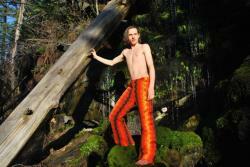 These awesome wool pants are fashioned from a recycled afghan blanket pure felted wool in orange and brown stripes. There is 1 stripe of acrylic yarn. These pants were actually "knitted" not crocheted; however the wool has felted into a very comfortable and thin fabric. These pants are too large for the skinny model, but it worksl the model in photos is 6 ft. Tall 30 " waist i think 34-38" waist and over 6 ft tall people will enjoy these pants the most. I can also finish the legs for shorter people. Great for men, women and everyone else afghan blankets are heritage textiles infused with color, texture and love. Part of our visual culture, crochet patterns evoke nostalgia, comfort, and warmth. 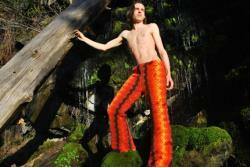 Crochet pants are stretchy and comfortable, warm yet breathable, eye-catching and vivid. In the words of one satisfied customer, they might be the best thing we ever ownedone of a kind, handcrafted item produced 100% in the usa.